In-mold decorating is a process for producing in-mold labels and graphics within a plastic enclosure. This in-mold labeling process usually takes place during the plastic injection molding cycle. In-mold decorating takes place when a preprinted label or decorated piece of labeling plastic is inserted in the open plastic injection mold and held in place via vacuum ports, electrostatic charge or another method. The plastic injection mold is then sealed, and plastic resin is then injected to mold the part, which encapsulates the decoration, or label, permanently within the finished injection molded part. There are numerous advantages associated with in-mold decorating and in-mold labels. This type of permanent graphics technology provides increased design flexibility and productivity over other methods. This includes the use of multiple colors, effects and textures in a single operation, long-lasting and durable graphics, and overall labeling and decorating cost reductions. In-mold decorating, which provides enhanced graphics in plastic, provides complete labeling and decorating within the complete plastic injection molded process. This means that secondary operations are no longer required, which eliminates post-molding labeling, decorating labor and equipment costs. 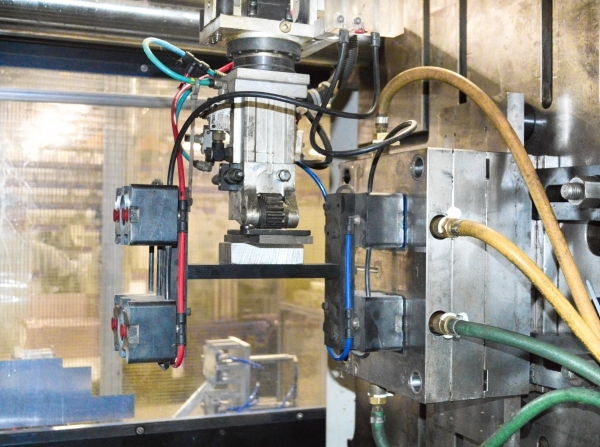 Lomont’s in-mold labeling process is primarily accomplished using robotics. Our process provides a surface coating that is abrasion proof, scratch resistant and permits a diversity of colors. It also will enable two-dimensional decoration and symbols on components with complex shapes. Our robotic machines can complete finished parts in a single operation. This method is very flexible in its application and permits parts to be generated with specific surface characteristics. Lomont provides a wide variety of ways to implement technically demanding, economically interesting, and sensible applications through In-Mold graphics. Due to its flexible nature [combination of plastic injection-molded part and functional film], In-Mold Decorating offers interesting solution options for your next permanent graphics project campaign. As an added benefit in-mold decorating and in-mold labeling can be considered a green process since the molded component is recyclable when using similar stock to injection molding resin. Printing is also much cleaner and emits lower levels of volatile organic compounds when compared to other application methods such as spray coating technologies. Additionally, the in-mold process often produces significantly less scrap than other methods such as adhesive labels because the decorated insert is shaped to fit precisely into the mold, so the position or registration of the graphic is highly consistent and permanent. Contact us for more information regarding our in-mold labels and decorating plastic processes, or request a quote today.